On paper the final day of camp looked simple, a 55K ride, a 90 minute swim and another 5.4K run, allowing me time to pack my bike, write a blog and chat with the athletes before we hit the bar. 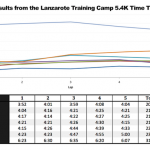 This didn’t factor for a week of training and in reality our 9:30 start rolled to 9:45, the Tabayesco time trial took longer to begin, we overran our swim (we had to complete the final session) and consequently delayed the guess-your-time 5.4K run. It was a full day that carried on till 1:30 in the bar for a handful of us. Which is why last night – technically this morning – I posted a brief update with our Huub towel winners and at 7am, after 5 hours sleep, I got up and packed two bikes (mine and Gill’s). And why an hour from landing at Gatwick I’m typing out a second day 7 blog containing the details of Friday’s events. There was a definite end-of-camp feel when we gathered at the front of the hotel – one last ride and we were basically done. Time keeping not at its strongest we rolled out in small bunches regrouping at the LZ-1 highway, and cruising north towards Arrieta. With favourable conditions Donna joined us for the ride, knowing she wouldn’t be able to manage the climb itself, but desperate to escape those poolside turbos (useful as they are). 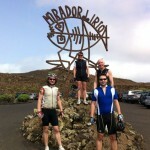 We gathered at the base of the Tabayesco climb. While I explained the route, turn left at the T-junction, and the order we would ride, slowest to fastest on 1 minute intervals, Donna persuaded a local – with a 20€ note – to give her a lift to the top. Mark and I synchronised stopwatches and he rode ahead to capture timings, given how hard the fast group had made him work all week, we allowed a generous 10 minute head start. One-by-one athletes followed, starting with Tim who I almost missed as I explained the left turn at the T-junction again, and ending with Rich gunning for a new PB. Once they’d left I hopped on my bike, gave myself a minute, and followed – I didn’t really want to be timed, but however unfit I may be felt obliged to conform to the time trial rules. I’ve not looked at my time – the file remains on the Garmin – but there were some good results from the camp, a few of the fast group brushing around the 30 minute mark. All results will follow in a later post. Rich didn’t quite make the PB, but a week of hard training wasn’t the perfect warm up; I promised we’d time trial on fresher legs next time. 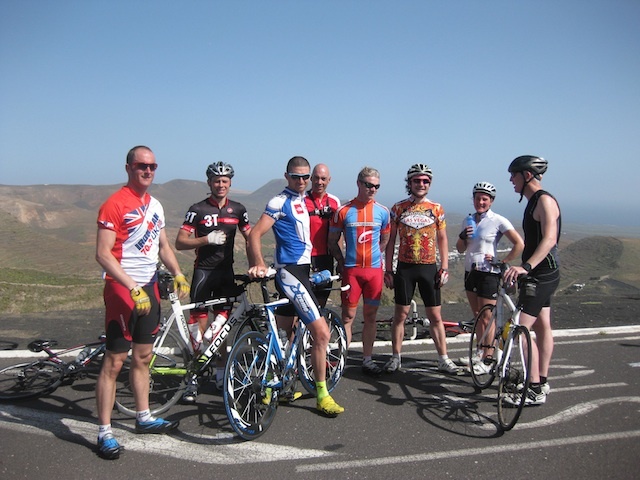 There was the obligatory coffee, cake and/or ice cream at the top before the group, including Donna, rolled down the hill through Teguise and back to Costa Teguise. Returning for a 2 hour break before the final swim. I have been consistently impressed by the athletes willingness to push themselves through the tough swim sessions we’ve thrown at them. 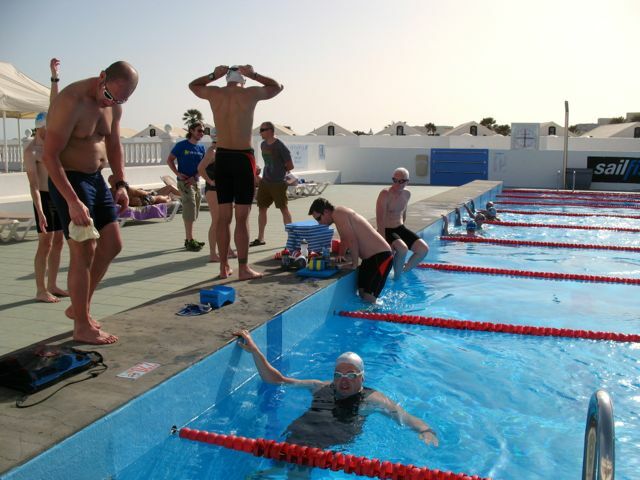 Perhaps it’s Mark’s motivating voice – audible from the neighbouring plaza – but throughout the week everyone has worked hard in the pool. The fast lane might have moaned (a lot), but ultimately they got on with the sets they’d been given. 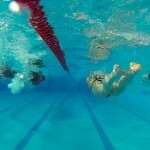 So while questions were asked when we gave them some kick after a bike heavy week, they did kick. Another 4K-plus set, taking Donna and quite a few more to their biggest swim week ever. Running late I gave those who were willing and able 20 minutes to change and join in the final run session of the week. Five laps of the block, just like Monday’s time trial, this time no watches and the winner was whoever finished closest to their prediction. It was surprisingly hard to prise the Garmins from certain athletes’ wrists – workouts still count when you don’t record data. The light winds remained making for a far easier run, but of those who finished few beat their predicted times and no one ran quite as fast as Monday; Ian ran closest to his prediction, only 19 seconds slower than his guess. Tired and hungry. That was camp done. Dinner and drinks followed late into the evening. And today we all made our way home, sad to leave Sands Beach behind and return to normal life.